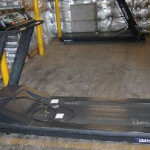 It doesn’t cost much time or money to keep your equipment in good shape. Metal rusts if not cared for, rubber can develop cracks, and moving parts in machines can start feeling rough. Removing and preventing rust will also prevent the health risks of coming into contact with too much rust, or worse, getting it into your eyes or mouth. Vacuum the floor first to get as much dust as you can so you won’t spread it around. After that, it’s your choice of cleaning products. Use something mild, or dilute it. This isn’t your bathroom. You’ll be touching the floor and other surfaces with your body, Especially you don’t want to be laying down onto a dried-up film of strong cleaning chemicals. As Brandon suggests, don’t go crazy with the amount of water on rubber mats. You don’t want the moisture to seep between the mats and get stuck on the plywood or concrete underneath, leading to mold. I use a biodegradable cleaner called Charlie’s Soap for everything in my home, including my gym. This applies to rubber coated dumbbells, rubber coated weight plates, or any other rubber surfaces or parts on other equipment. 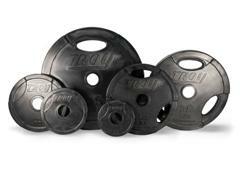 Factory oil – Rubber plates and dumbbells may arrive with a layer of dark factory oil on them. It protects them during storage and transport. Clean it off as described below. Rubber doesn’t require much maintenance if used indoors. It protects the underlying iron or steel from moisture, so rusting shouldn’t be an issue unless a lot of moisture has time to penetrate through the rubber. Clean them with a cloth soaked in a mild solution of dish soap and water, enough to get rid of the oils but not enough to leave a film behind. A tiny squirt in a half gallon of water is plenty. Wring out the cloth and wipe down the rubber good to get all the oil and dirt off from sweaty hands. Do NOT use a harsh cleaner like most spray cleaners meant to be “tough on grease.” You’ll take some of the rubber off. A gentle spray cleaner might be ok, but you could be doing long term damage that you won’t notice for a few months. After wiping, dry them with a lint-free cloth. 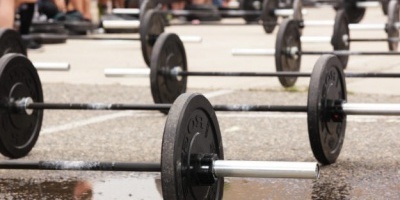 If your weights are frequently exposed to sunlight, apply a rubber cleaner/protectant to protect against UV and keep the rubber from drying out and cracking. Rubber is really sensitive to sunlight exposure, because it will expand and contract in the heat and just get damaged from the UV light. Technically there are ways to protect rubber with stuff like UV protectant sprays. But I don’t recommend it. Even if it’s non toxic, you naturally rub dumbbells against your clothes and body, and if nothing else you’ll rub it off. It’s best to avoid exposure to sunlight with rubber products, and go with urethane instead if you need it to be softer or more durable than painted iron. If it’s stored indoors and not exposed to direct sunlight, a rubber protector isn’t necessary. Rubber eventually starts to degrade anyway, and there’s not much you can do about that. Avoid extremes of heat and cold. The rubber will start cracking because of the way it will expand when hot and shrink when cold. Like rubber, urethane doesn’t require much maintenance. It protects the underlying iron or steel from moisture, so rusting shouldn’t be an issue unless a lot of moisture has time to penetrate through the rubber. It’s UV and temperature resistant, so there isn’t much that will harm it. Clean urethane the same as rubber, with a cloth soaked in a mild solution of dish soap and water, enough to get rid of the oils but not enough to leave a film behind. A tiny squirt in a half gallon of water is plenty. Wring out the cloth and wipe down the rubber good to get all the oil and dirt off of the urethane from sweaty hands. As with rubber, do NOT use a harsh cleaner like most spray cleaners meant to be “tough on grease.” You’ll take some of the urethane off or roughen the surface. Many bars need to be cleaned and oiled. See the Olympic Bar Maintenance article for in-depth information on everything related to maintaining and restoring bars. Most of the instructions also apply to standard bars. 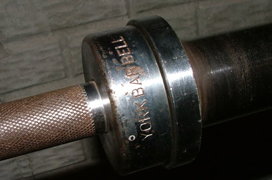 You also should store your barbell right to avoid damage. 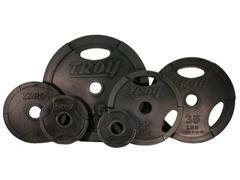 When you receive new weight plates from us, a layer of thick factory oil might be on them. This is to prevent rust during shipping and storage. Any household spray cleaner should be fine on iron plates, which usually have a baked-on enamel finish. You want to be more careful with rubber or urethane coatings. With that in mind, also don’t let overspray get on your rubber flooring. You can also clean it the same as rubber, with a cloth soaked in a mild solution of dish soap. Wiping them dry is important. Enamel paint coats pretty thin, and moisture can get in there pretty easily and cause rusting in no time at all. Weights tend to get scratched up over time or the finish wears off in spots, with nothing protecting the iron at all. On older weights you got at a garage sale, the enamel or other type of paint might not be baked on or might be loose, and any wiping or good cleaner could be the final straw to cause it to come off. If your weights are in that bad of shape, it’s best to resign yourself to the fact that the finish is done for and you need to get it off. 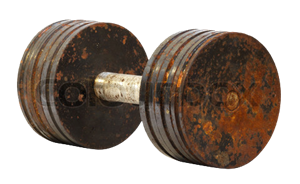 For getting off the rust and maybe even putting on a new coat of paint, see our article about bringing rusty weight plates back from the dead. The heads (ends) of the dumbbells are another matter. 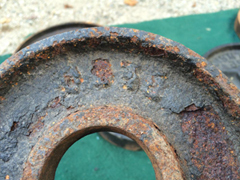 Use the same procedure as removing rust from and repainting weight plates, above. If the dumbbells are solid (ie: the ends can’t be removed), be sure to cover the handles with painter’s tape, unless you want to paint them too. 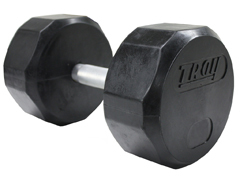 For dumbbells with chromed steel handles, the handles themselves can be cleaned according to the Olympic Bar Maintenance article. 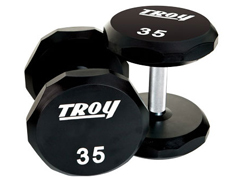 For rubber, urethane, neoprene or vinyl covered dumbbells, wipe them down with a cloth soaked in a solution of water mixed with a tiny amount of dish soap just like cleaning some other equipment as described above. 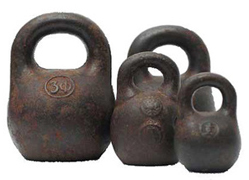 Iron kettlebells can generally be treated the same as iron weight plates or dumbbells. Check your owner’s manual for instructions on where to lubricate and what to use. Steel surfaces and handles can be cleaned with a cloth dipped in a very light solution of dish soap and water, and dried with a dry cloth. Spray cleaners are ok, but be careful of any overspray onto rubber surfaces, as any chemicals stronger than dish soap will eat away at the rubber. Silicone or teflon spray is normally ok, particularly on any internal parts that are not very exposed and won’t collect dust, as long as it doesn’t conflict with the manufacturer’s recommendations. Guide rods – These are what the weight carriage moves up and down along, or the adjustable slider on a bench. Clean these with a rag to remove any dust, and then apply a coating of oil or 3-in-One Dry Lube with another rag. This will keep the guide rods well lubricated so the carriage slides easily on them. A dry lube is one that sprays on and dries quickly to create a slick surface. A silicone spray is fine and I think is what most people use, but it can attract dust and also get on your hands. Cables – Cables that are frayed, bent or twisted need to be replaced. Machines pretty much all use stainless steel aircraft grade cables. Under normal use it’s hard to damage them, but follow the manufacturer’s recommendations on any periodic replacement. Seat Upholstery – Clean with a cleaning and deodorizing spray. The VaporFresh spray is a good one because it cleans off oil, deodorizes, and kills bacteria, all with natural ingredients such as essential oils that is not bad for your skin. Steel Frames – Wipe down with a rag wet with a solution of warm water mixed with a tiny amount of dish soap, or use a spray cleaner. Wipe the frame dry with a dry rag to avoid rusting. Clean any rubber parts as outlined in the Rubber Products instructions. 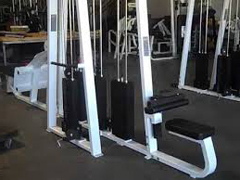 Thank you for the post on cleaning and maintaining workout equipment. I definitely think you should know how to properly maintain equipment to make sure everything is in working order. It’s not only a chance to clean the equipment but to also ensure the safety of the machine or weight. Very helpful. I just bought a fairly nice set that’s been stored in a shop and needs some cleaning. Thanks! 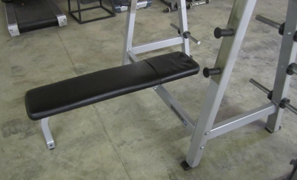 Any thoughts on how to lubricate the guide post for an adjustable bench(flat bench that can become an incline bench). This post slides inside a metal “sleeve”. Sort of like if you were going to raise and lower the seat of a preacher curl. Should I use the light 3 and 1 oil or the teflon grease? Good question! A silicone or teflon grease like you mention (the teflon actually contains silicone) would work. An alcohol based lubricant is the only one that would be a bad idea, because it can damage some plastic. The downside is silicone and teflon spray can attract dust and can get on your hands. I think the best method is to clean the area well and then spray on a dry lubricant. I’ve used Sailkote, but anything called a “dry” lubricant should work good. It dries in seconds and creates a slick but dry surface. I’ll update the article with this info. That makes sense! Thank you! I just purchased a used bench press, preacher curl, bars and plates. They weren’t in bad shape but had a little rust and dirt. I opted to dismantal everything and I am now in the process of putting it all together. This article really helped. Thank you! Good luck with it all! I’m always impressed by how much old rusty equipment that looks like it should be tossed out can be cleaned up. I don’t know of anything that will actually dissolve chalk, but there are ways of getting it off or out of stuff. What are you dealing with? Rubber floor? 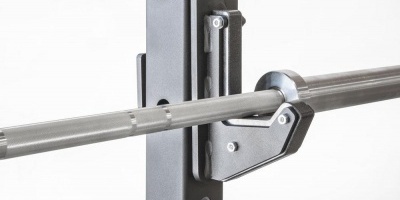 Bar knurling?